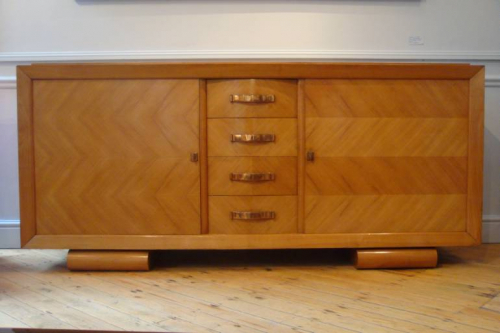 A very unusual and well made credenza from the French Art Deco period c1930. Using expensive materials the main carcass is contructed from Oak which has been thickly veneered with Cherry wood. The quality is emphasised by the patterned herringbone parquetry to the front which is unusually matched on the inside of the doors. The copper handles and key add warmth and are original to the piece. Inside there are shelves which are adjustable according to height required. A stunning, rare and beautifully made piece which is in fantastic original condition.